@indiannie_jones It is for the 2nd which for me would be tomorrow. @naomi Thanks you are so sweet. Great cause that Barbara is leading. Constance this is fantastic. Thank you so much for helping raise the cause. Nice shot. Like the heart shaped crackers. @seattle --- A fantastic tribute to your friend. @winosandfoodies --- You are lifted by your 365 friends. Keep fighting the good fight. Nice photo, and I'm assuming for a great cause, but I am not sure what it is. @digitalrn Barbara Harris is a member of 365. I have put her URL on the bottom of this photo for you to get more information on the project she is sponsoring. @peggysirk Can't wait to see yours! OMG, this is so cute!! How on earth did you cut those triscuits without crumbling them? @clarissajohal very carefully...went thru about 1/4 of a box to get these! Oh dear!! At least the crumbles are tasty too!! Aww, this is fab! So very creative and its looks great! *Say Cheese! * (and Crackers!) is a photographer's favorite! I'm so glad to see teamwork through this community to support Barbara's liveSTRONG with Yellow Food cause. It's wonderful to meet other caring people! This is such a fabulous and creative photo! Thanks for making me aware of Barbara's special project. I checked out her website and was amazed at her story. I wasn't prepared for a 'food shot' tonight...but I did try to pay homage to her and survivors like her on my project. Again, thanks... Love this shot! 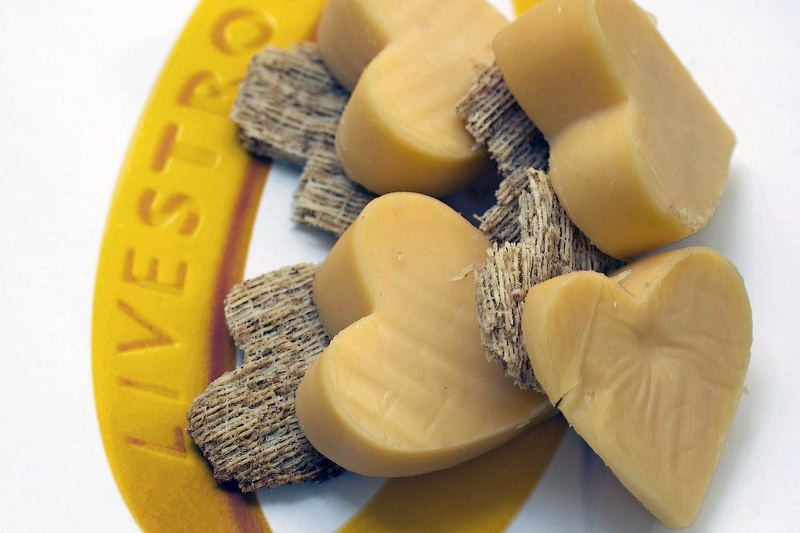 A fan of cheese, crackers and Livestrong and now Barbara's Livestrong project! Terrific idea! Got to love cheese and crackers. Great photo. I love what you did here. Love that.... and the patience! Awesome picture Constance and so creative! A great tribute too. This is great- I love the placement and textures! I just LOVE your photo in tribute of a great cause. I love the DOF, nice shot!